A 25-day sale on the newest fall/winter releases with early access for Nordstrom cardholders, the Nordstrom Anniversary Sale kicks off exclusively for cardholders July 12-19, 2018. The sale then opens to the public July 20-August 5. 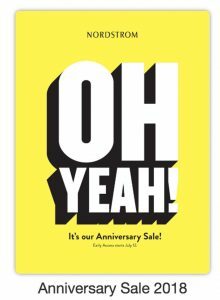 Everything from women’s, men’s, kid’s, home decor and beauty is a part of the sale. Popular items DO tend to sell out fast. Many of the items that sell out quickly during the exclusive card holder access period have (historically) been restocked when the sale opens to the public, but if you have a Nordstrom card, I’d just order your favorites early and not worry about it. 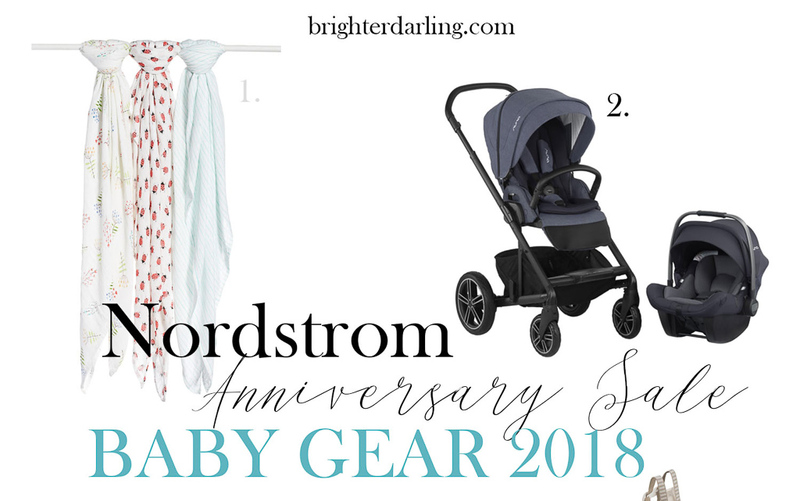 So, I did scour the clothing items from the Nordstrom sale and although there are SO SO MANY adorable outfits, coats, winter wear, etc., I’m advising against buying clothing because if you’re having a baby around when I am (October), you have so much time to build baby’s wardrobe. Clothing is the LAST thing I’d recommend buying for baby from the Nordstrom Sale. 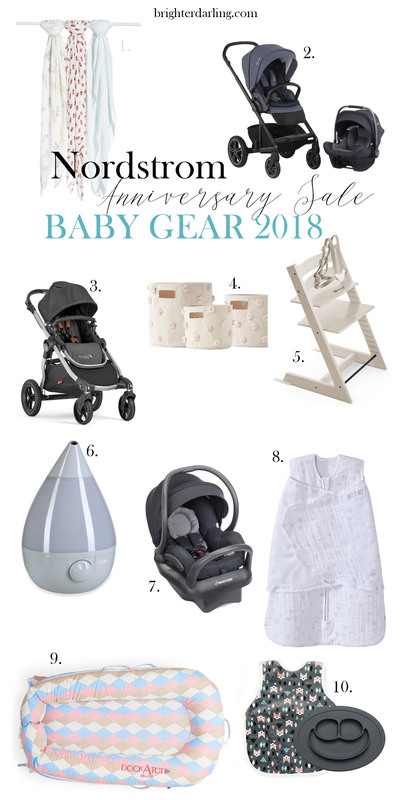 What I do recommend is the baby gear. These are things that should stand the test of time, you can use over again and/or will hold their value if you want to sell when you’re done using them. FYI: P.S: All of these items will appear as sold out before the sale starts (July 12th) and/or if you don’t have a Nordstrom card. Sale opens to the public July 20th. I’ll warn you, I already missed out on the Dock A Tot in the print I wanted… so unless it restocks tomorrow with all the prints they had available initially on July 12th, you should order it ASAP if it’s something you wanted. I did order the Petit Pehr canvas totes because I’ve been eyeing the adorable Pehr designs for a while and the sale price cannot be beat… and would SERIOUSLY consider one of the strollers because strollers are such a high price item for a top quality, easy to use/push one that will last, and the deals on those two are incredible. If my friends/family didn’t already get me my car seat, I LOVE that Maxi Cosi one for the light weight and safety. Bonus for the great price! What are you picking up for your little one during the sale? I know the clothing is SO tempting, but I have to resist. If you’re already a mom, let me know if I’m missing anything that’s a TOTAL MUST! "Urban Decay Born To Run Palette Review"
"Too Faced Born This Way Multi Use Sculpting Concealer Review + Demo"